I would like to thank CombatConn and Vettix for some great tickets. The event was amazing and there was so much to see and do. 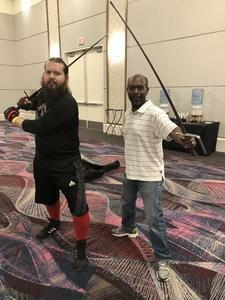 Especially since the Warrior Pass allowed us to take part in any training and watch any event or tournament. My girls loved it and so did we. Thank you CombatConn LLC and VetTix for providing my family the opportunity to attend CombatCon 2018 in Las Vegas! It was an amazing display of weapons, fighting styles, and tournaments. Everyone at the event was eager to assist and willing to help with the schedule, directions, lessons, vendors, and most importantly, to thoroughly explain the details about their specialty. This was the first event that we attended after moving to Las Vegas just last month (July 2018); you helped my family adjust to the new area with such a great event. We thank you again and truly appreciate the support and generosity! 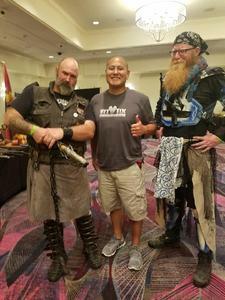 Thanks to #VetTix and #CombatCon for your generous donation of Warrior Passes for your event. We always have a great time. We appreciate the information from all the presenters. Also, the hands on demonstrations was really a valuable experience as we were able to learn a great deal from them. I look forward to next year! Thanks again!